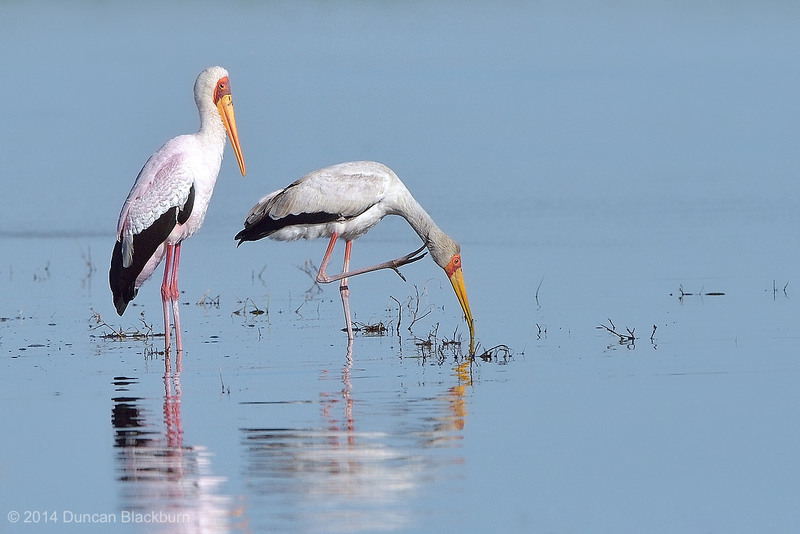 This is a large wading bird in the stork family Ciconiidae. It occurs in Africa south of the Sahara and in Madagascar. It is a medium-sized stork. Length: 97 cm; average body weight for males: 2.3 kg; for females: 1.9 kg. Its plumage is mainly pinkish-white with black wings and tail. The bill is yellow, blunt, and decurved at the tip. Immature birds are greyish brown with dull greyish brown bill, dull orange face and brownish legs. The early morning mist and light combine to obscure the horizon line giving an almost surreal atmosphere to this scene.